Growing up my favorite part of Easter was waking up in the morning, running into the kitchen and seeing what the Easter Bunny (a.k.a. my mom) had put in mine and my brother’s baskets. There was always a book, treats, eggs and some sort of Easter themed goodie or toy. This tradition was always fun and since Owen was born I’ve been excited to get it started in our household. Last year he was still a bit too young, but this year he seems to be interested in getting his hands on just about everything so we thought we’d give it a try. 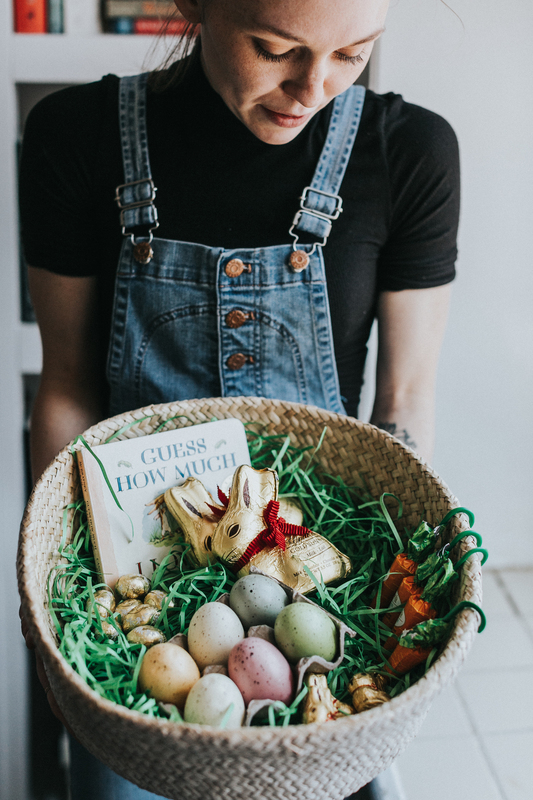 We didn’t go too crazy on his basket this year, but I had so much fun sharing it with him, giving him a taste of the Lindt Chocolate Bunny and letting him play with the rest of the goodies in his basket. Since he just hit the 18 month mark I thought I would share how I put his basket together with you guys. 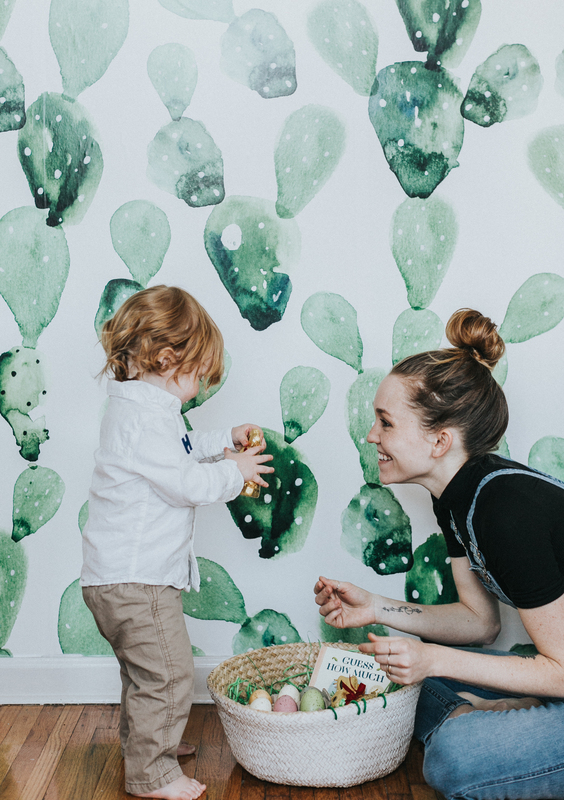 Today I’m partnering with The FeedFeed and Lindt Chocolate to give you some ideas on how to incorporate younger toddlers into the Easter basket tradition with just five items. 1) Purchase a basket you will use in your household after the holiday is over. This mentality is something we really try to strive for with all our purchases, but it can be especially difficult when it comes to seasonal ones. I went with a larger, neutral basket that can be used in Owen’s playroom for toys or elsewhere for newspapers rather than the traditional brightly colored plastic basket. 2) Purchase your favorite, timeless. This may seem silly since the basket is for your little one, but chances are you will enjoy the majority of the treats. We went with the Lindt GOLD BUNNY chocolates, LINDOR eggs and Lindt Chocolate carrots - not only are they DELICIOUS, but they are nostalgic. I remember getting a Lindt GOLD BUNNY each year and it’s part of my personal Easter tradition that I wanted to pass down to Owen. 3) Pick up a cardboard book your little one will enjoy long after the holiday is over. “Guess How Much I Love You” is a classic, but still hits on the Easter theme. Owen is all about books so adding another to his collection was a no brainer. I went with the cardboard copy in case eating the candy and reading all happened around the same time, that way you can easily clean off the pages. 4) Skip coloring your own eggs. While coloring eggs is definitely something I’m looking forward to next year or the year after with Owen, we kept it simple this year and avoided a HUGE mess and headache. I purchased these speckled eggs online and saved myself a ton of time! Owen had so much fun taking them in and out of the cardboard case too! 5) Bring in color with your basket grass. Of course we wanted Owen’s Easter basket to be bright and cheery, but since space is limited we weren’t interested in adding that color with more toys (he has plenty). So I went with the matt, green grass to fill the basket. This 99 cent trick made the basket that much more inviting! Have you established any Easter traditions in your household? Are any of them from your own childhood?